1. So here’s an intriguing update to the stalled redevelopment at 413-415 West Seneca Street. Ithaca Neighborhood Housing Services was preparing to buy the former Ithaca Glass property and its development plans, which had hit a major snag due to structural issues with the existing building, and continued financial issues with pursuing of a completely new build (bottom). INHS was planning on purchasing the site and going with the original plan, which would have added four units to the existing two apartments and vacant commercial space. But someone outbid them for the site. The buyer, who has not finalized the purchase, may elect to use either of the plans designed by STREAM Collaborative, or pursue a different project at the site. While that plan may have fallen through, it looks like the INHS Scattered Site 2 rehab/redevelopment plan will be moving forward following approval of amendments to the funding plan by the IURA and Common Council. The revised plan will dedicate funds toward the replacement of fourteen units (four vacant due to structural issues) in three buildings to be replaced with a new thirteen-unit apartment building at 203-208 Elm Street on West Hill, and major rehabiliation of four other structures (sixteen units) in Southside and the State Street Corridor. 2. Speaking of sales, here’s something to keep an eye on – the Lower family, longtime Collegetown landlords, sold a pair of prime parcels on October 4th. 216-224 Dryden Road was sold for $2.8 million, and 301 Bryant Avenue was sold for $1.4 million. Both properties were sold to LLCs whose registration address was a P.O. Box. A couple of local development firms like to use P.O. Boxes, but with nothing concrete, it’s uncertain who’s behind the purchases. 301 Bryant Avenue has some historic significance as the formal home of the Cornell Cosmopolitan Club. Founded in 1904 as a men’s organization to provide camaraderie and support for international students attending the university, the 13,204 SF, 35-bedroom structure was built in 1911 and served as the equivalent of a fraternity’s chapter house, providing a shared roof, shared meals, social events, lectures by students and faculty about other lands and cultures, and professional networking for students arriving from abroad. A women’s club was organized in 1921. As Cornell grew and different international groups founded their own organizations, the club’s purpose was superseded, and shut down in 1958. The building was purchased by the parishioners of St Catherine’s a parish center before the new one was built in the 1960s, and served as a dorm for the Cascadilla School before Bill Lower bought the building in 1973. Lower converted the structure into a six-unit apartment building, with the largest nit being eight bedrooms. With an estimated property assessment of $1.27 million, the sale appears to be for fair value – no issues, and no indications of redevelopment. 216-224 Dryden Road is much more interesting from a development perspective. 11,600 SF in three buildings (county data suggests either 14 units, or 9 units and 20 single occupancy rooms), the earliest buildings in the assemblage date from the early 1900s, but with heavy modifications and additions to accommodate student renter growth. Bill Lower bought the property way back in 1968. The properties are only assessed at $1.87 million, well below the sale price. That suggests that a buyer may be looking at redevelopment of the site. The site is in highly desirable inner Collegetown, and the zoning is certainly amenable; CR-4 zoning allows 50% lot coverage and four floors with no parking required. CR-4 offers a lot of flexibility – 119-125 College Avenue and the Lux are recent CR-4 projects. 3. The other recent set of big purchases also occurred on October 4th. “325 WEST SENECA ASSOCIATES LLC” bought 111 North Plain Street, 325 West Seneca Street, 325.5 West Seneca St (rear building of 325) and 329-31 West Seneca Street for $1.375 million. 325 West Seneca is a three-unit apartment house assessed at $200k, 325.5 West Seneca is a modest bungalow carriage house assessed at $100k, 329-331 West Seneca is a two-family home assessed at $360k, and 111 North Plain Street in a neight-unit apartment building assessed at $475k. Added up, one gets $1.135 million, which suggests the purchase price was reasonable. Given that 327 West Seneca is currently the subject of a moderate-income redevelopment proposal from Visum, one would expect Visum to likely be behind these purchases, right? But the LLC traces back to the headquarters of a rival real estate development firm, Travis Hyde Properties. The whole thing strikes me as a little odd, but who knows, maybe Frost Travis bought the properties as stable assets rather than development sites. 4. Let’s stick with Travis Hyde Properties for a moment – here are the submissions related to his Falls Park Apartments proposal. Readers might recall this is the plan for 74 high-end senior apartments on the former Ithaca Gun site. Drawings here, 138-page submission package courtesy of TWMLA’s Kim Michaels here. Trowbridge Wolf Michaels Landscape Architecture will handle the landscape design, and newcomers WDG Architecture of Washington D.C. are designing the building. No cost estimate has been released for the project, but buildout is expected to take 20 months. 150 construction jobs will be created during buildout, and the finished building will create four permanent jobs. The project will utilize New York State Brownfield Cleanup Program (NYS BCP) tax credits. In the case of this project, the credits would be a smaller credit to help cover the costs of site remediation insurance, and a larger credit awarded by the state that would cover 10-20% of the project’s property value, depending on whether it meets certain thresholds. It is still not clear at this point if a CIITAP tax abatement will be pursued. The 74 units break down as follows: 33 two-bedroom units (1245 SF), 9 one-bedroom units with dens (1090 SF), and 32 one-bedroom units (908 SF). All units include full-size kitchens, wood and/or natural stone finishes, and about half will have balconies. Also included in the 133,000 SF building is 7,440 of amenity space, and there will be 85 parking spaces, 20 surface and 65 in the ground-level garage. A number of green features are included in the project, such as LED lighting, low-water plumbing fixtures, and a sophisticated Daikin AURORA VRV high-efficency HVAC system, which uses air-source heat pumps. It look like there is some natural gas involved, however, for heating the rooftop ventilation units, and in the amenity space’s fireplace. Due to soil contamination issues, the plan is essentially to dig up the soil and cart it off to the landfill in Seneca County. The soil runs up to 11.5 feet deep, and the building foundation will be 15 feet below current surface level (about 85% of the foundation will be a shallow slab, with deeper piles near the northeast corner). As a result, some of the bedrock will be removed and disposed of as well. What soil does remain on-site will be sealed in a NYSDEC-approved cap. Concerns about VOCs in the groundwater are somewhat mitigated by the geology of the site (horizontal fractures carry the VOCs downhill), but the ground level is a ventilated garage in part to prevent sustained exposure to vapor intrusion. The project will be presented at this month’s Planning Board meeting, where the board is expected to declare itself lead agency for environmental and site plan review of the proposal. 5. So, one of the reasons why the Voice writeup on the Carpenter Park site didn’t include building renders was because in a follow-up phone call for hashing out the emailing of PDF images, Scott Whitham of Whitham Planning was adamant they not be used, describing them as highly conceptual. He didn’t even want to pass them along out of fear they’d mislead the general public. For the merely curious, here are images taken by Second Ward Councilman Ducson Nguyen. The architecture firm that’s involved with the project is a newcomer to the Ithaca area – Barton Partners, which has a lot of rather high-end, traditional-looking design work scattered throughout the Northeast, as well as a new more modern designs similar to the placeholders. Can’t make any hard conclusions at this point, but a look through their portfolio gives an idea of what one might expect to see with the Carpenter Park redevelopment. 6. The former Wharton movie studio at Stewart Park is slated to become a gallery and visitor’s center, thanks to a $450,000 state grant. The building, which was the studio’s main office from 1914 to 1920, and is currently used by the city Board of Public Works, will be renovated into the Wharton Museum, with exhibit space, a public meeting room, and a terrace / seating area overlooking the lake. The project will be a joint effort by the Wharton Studio Museum and Friends of Stewart Park, with assistance from the City of Ithaca. Todd Zwigard Architects of Skaneateles (Skinny-atlas) will be in charge of designing the new museum space. It will be fairly modest in size, about 1,000 square feet, with the rest remaining for BPW use; the public works division will compensate the loss of space with an addition onto its annex nearby. The project should dovetail nicely with a couple of other local nonprofit projects underway – the revitalization and expansion of the Stewart Park playground will give younger visitors something to do while their parents or grandparents check out the museum, and there’s potential to work with The Tompkins Center for History and Culture on joint projects that encourage visitors to pay a visit to both Downtown and the lakefront. 7. The Old Library redevelopment is once again the subject of controversy. Due to structural issues with the roof and concerns about it collapsing onto workers during asbestos abatement, the city condemned the building, which changed Travis Hyde Properties plans from sealing the building in a bubble and removing the asbestos before demolition, to tearing it down without removing asbestos from the interior first. Much of the asbestos from its late 1960s construction was removed as part of renovations in 1984, with more in the 1990s, but in areas that weren’t easily accessible, it was left in place. The new removal plan has led to significant pushback, led by local environmental activist Walter Hang. A petition floating around demands that the city un-condemn the building and then forces Travis Hyde to renovate the building enough to stabilize the roof to remove the asbestos. While the concern about the asbestos is merited, there are a couple of problems with this plan. It boils down to the fact that New York State code, rather than the city, defines what a developer can and can’t do with asbestos abatement. The two options here are stabilization and removal before demolition of the above-ground structure, or tearing it down piece by piece and using procedures like misting to keep the asbestos from getting airborne, with monitors in place to ensure no fibers are entering the air. The city can’t force a developer to choose one approach over another, if a building is condemned, and the city can’t force Travis Hyde to renovate the building to a state where it wouldn’t be condemned. That would be the NYS Department of Labor’s role. But if the city rescinded its condemnation, a roof renovation would involve removing the existing roof – a procedure that involves misting the on-site asbestos to keep it from getting airborne. With workers going in an out of the building to stabilize the structure and being put at risk by the unstable roof as well as the asbestos, the Department of Labor isn’t going to sign off on anything putting crewmen at risk of a roof collapse. There is some consternation with this, and that’s fair. The development project did take several months longer to move forward than first anticipated, though had it started on time it’s not clear if the city and THP wouldn’t have been in this position anyway if work had started sooner. Demolition is expected to start within thirty days of the permit being issued (and it has, so in effect, any day now), and take six to eight weeks to complete. 8. Unfortunately, I had to miss this year’s architects’ gallery night, which is a shame because the local firms like to sneak in yet-unannounced plans. Case in point, this photo from Whitham Planning and Design’s facebook page clearly shows something is planned at the site of the Grayhaven Motel at 657 Elmira Road. The Grayhaven has four on-site structures, and the two westernmost buildings look as they do now…but the footprints of the two eastern buildings, where one first pulls in, do not match their current configuration. Intriguing, but also frustrating. The boards on the floor are related to the Visum Green Street proposal, and the other wall board is a North Campus proposal that didn’t make the cut, previously discussed on the blog here. 9. Out in the towns, there’s not a whole lot being reviewed as of late. The town of Lansing will have a look next week at marina renovations, a one lot subdivision, and a 4,250 SF (50’x85′) expansion of a manufacturer, MPL Inc., a circuit board assembler at 41 Dutch Mill Road. The expansion of their 14,250 SF building will create five jobs or less, per site plan review documents. In Dryden town, the town board continued to review the proposed veterinary office in the former Phoneix Books barn at 1610 Dryden Road, and they’ll had a look at a cell phone tower planned near TC3. Danby’s Planning Board looked at an accessory dwelling application and a two-lot subdivision last week. Ulysses had a look at a proposal for a 6,400 SF pre-school and nursery building planned for 1966 Trumansburg Road, a bit north of Jacksonville hamlet. The village of Cayuga Heights Planning Board has a single-family home proposal to look at 1012 Triphammer Road, and in the village of Lansing, the Planning Board and Board of Trustees will review and weigh consideration of a PDA that would allow the Beer family’s proposal for multiple pocket neighborhoods of senior cottages to move forward on 40 acres between Millcroft Way and Craft Road. Trumansburg is still looking at the 46 South Street proposal from INHS and Claudia Brenner. 10. Last but not least, the city of Ithaca Planning Board’s agenda for next week. Apart from the long-brewing Carpenter project, there’s nothing else that’s new, continuing the relative lull in new projects. Cornell’s North Campus Expansion continues its public hearing, and the new warehouse and HQ for Emmy’s Organics looks ready to obtain final site plan approval. Project Description: The applicant is proposing to subdivide the 1.71 acre property onto two parcels: Parcel A measuring 1.6 acres (69,848 SF) with 299 feet of frontage on S Geneva St and 173 feet on W Clinton St and containing two existing buildings, parking and other site features; and Parcel B measuring .1 acres (4,480 SF) with and 75 feet of frontage on W Clinton St and containing one multi-family building. The property is in the P-1 Zoning District which has the following minimum requirements: 3,000 SF lot size, 30 feet of street frontage, 25-foor front yard, and 10-foot side yards. The project requires an area variance of the existing deficient front yard on the proposed Parcel B. The project is in the Henry St John Historic District. This is an Unlisted Action under the City of Ithaca Environmental Quality Review Ordinance (“CEQRO”) and the State Environmental Quality Review Act (“SEQRA”), and is subject to environmental review. The story behind this is that for legal purposes, INHS needs to split an existing house from its multi-building lot before it can proceed with renovating it as part of the Scatter Site Housing renovation project. No new construction is planned. Project Description: The IURA is proposing to subdivide the 6-acre parcel into four lots. Lot 1 will measure 1.012 acres, Lot 2 will measure 1.023 acres, Lot 3 will measure 2.601 acres, and Lot 4 will measure .619 acres. Lot 3 will be sold to Emmy’s Organics (see below), Lot 4 will be left undeveloped for future trail use, and Lots 1 & 2 will be marketed and sold for future development. This subdivision is part of a larger development project that is a Type I Action under the City of Ithaca Environmental Quality Review Ordinance (“CEQRO”) §176-4 B(1) (c) and (j) and B(4) the State Environmental Quality Review Act (“SEQRA”) §617-4 (b) (11), for which the Planning Board made a Negative Declaration of Environmental Significance on September 25, 2018. The Emmy’s Organics project is really two components – one, the new building in the city-owned Cherry Industrial Park, and two, the city’s (IURA’s) construction of a street extension that would service Emmy’s and two smaller lots which could then be sold to a buyer committed to economic growth for presently low and moderate-income households. Project Description: The IURA is proposing to extend Cherry Street by 400 feet. The road will be built to City standards with a 65-foot ROW, 5-foot sidewalks and tree lawn, and will be turned over to the City upon completion. The road extension is part of a larger development project that is a Type I Action under the City of Ithaca Environmental Quality Review Ordinance (“CEQRO”) §176-4 B(1) (c) and (j) and B(4) the State Environmental Quality Review Act (“SEQRA”) §617-4 (b) (11), for which the Planning Board made a Negative Declaration of Environmental Significance on September 25, 2018. Project Description: Emmy’s Organics is proposing to construct a production facility of up to 24,000 SF, with a loading dock, parking for 22 cars, landscaping, lighting, and signage. The project will be in two phases: Phase one, which will include a 14,000 SF building and all site improvements; and Phase two, (expected in the next 5 years) which will include an addition of between 14,000 and 20,000 SF. As the project site is undeveloped, site development will include the removal of 2 acres of vegetation including 55 trees of various sizes. The facility is part of a larger project that includes subdivision of land a 40-foot road extension by the Ithaca IURA extension that is a Type I Action under the City of Ithaca Environmental Quality Review Ordinance (“CEQRO”) §176-4 B(1) (c) and (j) and B(4) the State Environmental Quality Review Act (“SEQRA”) §617-4 (b) (11), for which the Planning Board made a Negative Declaration of Environmental Significance on September 25, 2018. Project Description: The applicant proposes to build a 133,000 GSF, four-story apartment building and associated site improvements on the former Gun Hill Factory site. The 74-unit, age-restricted apartment building will be a mix of one- and two-bedroom units and will include 7,440 SF of amenity space and 85 parking spaces (20 surface spaces and 65 covered spaces under the building). Site improvements include an eight-foot wide public walkway located within the dedicated open space on adjacent City Property (as required per agreements established between the City and the property owner in 2007) and is to be constructed by the project sponsor. The project site is currently in the New York State Brownfield Cleanup Program (BCP). Before site development can occur, the applicant is required to remediate the site based on soil cleanup objectives for restricted residential use. A remedial investigation (RI) was recently completed at the site and was submitted to NYSDEC in August 2018. The project is in the R-3a Zoning District and requires multiple variances. This is a Type I Action under the City of Ithaca Environmental Quality Review Ordinance (“CEQRO”) §176-4 B(1) (h), (k) and (n) and the State Environmental Quality Review Act (“SEQRA”) §617-4 (b) (11). Special Meeting October 30, 2018: City Sexual Harassment Policy, Special Permits (Some of the BZA’s Special Permits Review duties are set to be transferred to the Planning Board). Being as large and complex as it is, it was hard to figure out a way to present the Maplewood project clearly and coherently. After some thinking, it seems the best combination of clarity and detail will be to split it into three sections. This section, Part I, will be an overview of the site history and project planning. Part II will examine and break down the site plan with all of its contributing structures. Part III will be the regular construction update, which will be bi-monthly just like all the others. 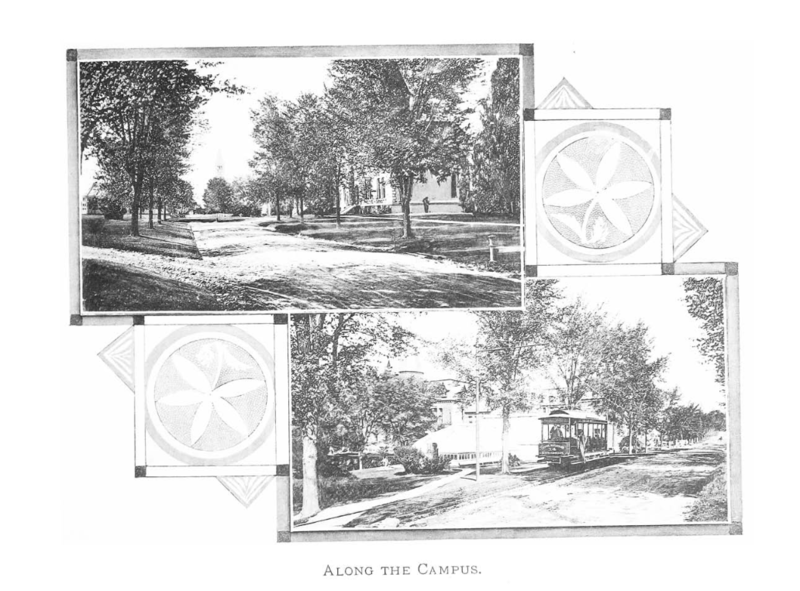 Quick primer note – Maplewood Park was the name of the old complex. The new one is just called “Maplewood”. With the shorthand for Maplewood Park being Maplewood, it can get confusing. Let’s start with the background. Love it or not, Cornell University is one of the major defining organizations of the Ithaca area. It employs nearly 10,000 people and brings billions of dollars in investment into the Southern Tier, Tompkins County and Ithaca. That investment includes the students upon which the university was founded to educate. Traditionally, neither founder Ezra Cornell nor first university president Andrew Dickson White were fans of institutional housing. Their preference was towards boarding houses in the city, or autonomous student housing (clubs, Greek Letter Orgs, etc), where it was felt students would learn to be more independent. This mentality has often underlain Cornell’s approach to housing – it’s not a part of their primary mission, so they only build campus housing if they feel it helps them meet academic and institutional goals. If many potential students are opting for other schools because of housing concerns, or the university is under financial strain because it has to subsidize high housing costs in their scholarships, then Cornell is motivated to build housing in an effort to improve its situation and/or become more competitive with peer institutions. With that in mind, being one of the top-ranked schools in the world means that, in the historical context of the university’s goals and plans, new housing is rarely a concern. Cornell will update housing in an effort to be more inclusive and to improve student well-being, but with labs, classrooms and faculty offices taking precedence, building new housing is rarely an objective. Only about 46% of undergrads live on campus, and just 350 of over 7,500 graduate and professional students. From 2002 to present, Cornell has added 2,744 students, with a net increase in Ithaca of about 1900. The net increase in beds on Cornell’s Ithaca campus during that same time period is zero. While Cornell did build new dorms on its West Campus, they replaced the University “Class of” Halls. 1,800 beds were replaced with 1,800 beds. In fact, the amount of undergraduate and graduate housing on campus had actually decreased as units at Maplewood Park and the law school Hughes Hall dorm were taken offline, either due to maintenance issues, or for conversion to office/academic space. When the announcement for further decreases came in Fall 2015, I wrote a rare Ithaca Voice editorial, and even rarer, it brought Cornell out to the proverbial woodshed for poor planning and irresponsibility. To be fair, while Cornell was the guilty body, removing housing isn’t a problem on its own. It’s when the local housing market can’t grow fast enough to support that, that it becomes a problem. 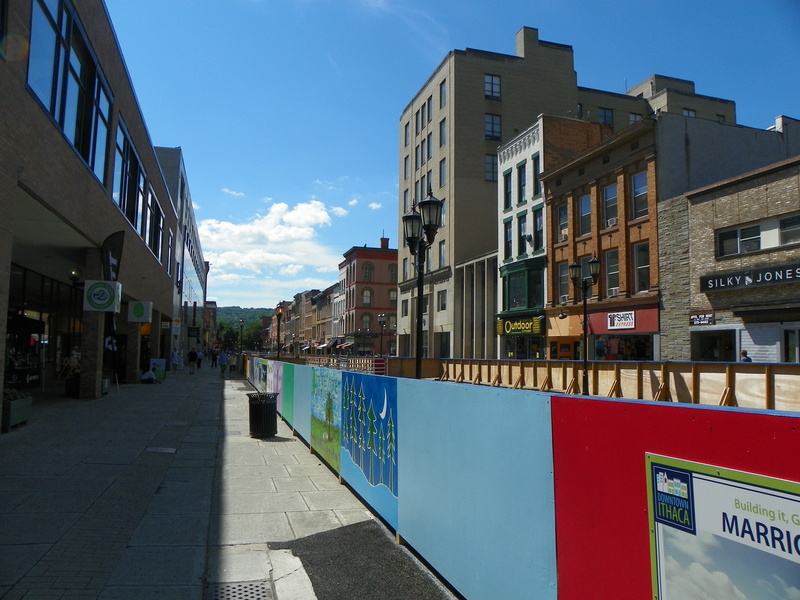 The Tompkins County market is slow to react, for reasons that can be improved (cumbersome approvals process) and some that can’t (Ithaca’s small size and relative isolation poses investment and logistical hurdles). In the early and mid 2000s housing was added at a decent clip, so the impacts were more limited. But housing starts tumbled during and after the recession, and it was unable to keep up. As Cornell continued to add students in substantial quantities, it became a concern, both for students and permanent residents. By the mid-2010s, Cornell was faced with financial strains, student unhappiness and worsening town-gown relations, all related to the housing issue. As a result, the past couple years have become one of those rare times where housing makes it close to the top of Cornell’s list of priorities. In weighing its options, one of the long-term plans was to redevelop the 17-acre Maplewood Park property. The property was originally the holdings of an Ellis Hollow tavern keeper and the Pew family before becoming the farmstead of James and Lena (sometimes Lyna) Clabine Mitchell in the early 1800s. In 1802, James was passing through from New Jersey to Canada with plans to move across the border, but stopped in the area, liked it, and bought land from the Pews, then moving the rest of his family up to Ithaca. Apparently there’s a legend of Lena Mitchell attacking and killing a bear with a pitchfork for eating her piglets. Many of the home lots in Belle Sherman were platted in the 1890s from foreclosed Mitchell property. Like many of the Mitchell lands, it looks like the property was sold off around 1900 – a Sanborn map from 1910 shows a brick-making plant on the property along the railroad (now the East Ithaca Rec Way) and not much else for what was then the city’s hinterland. It’s not clear when Cornell acquired property, but by 1946, Cornell had cleared the land to make way for one of their “Vetsburgs”, also known as Cornell Quarters. The 52 pre-fabricated two-family homes were for veterans with families, who swelled Cornell’s enrollment after World War II thanks to the GI Bill. Once the GIs had come and gone, Cornell Quarters became unfurnished graduate housing, geared towards students with families, and international students. The Cornell Quarters were meant to be temporary, and so was their replacement. In 1988-89, the university built the modular Maplewood Park Housing, with 390 units/484 beds for graduate and professional students, and an expected lifespan of 25 years. The intent was to replace them with something nicer after several years, but given Cornell’s priorities, and housing typically not among them, it fell to the back burner. As temporary units with marginal construction quality and upkeep, poor-condition units were closed off in later years, and capacity had fallen to about 356 beds when the complex’s closure was announced in May 2015 for the end of the 2015-16 academic year. Cornell had long harbored plans to redevelop the Maplewood site – a concept schematic was shown in the 2008 university Master Plan. After weighing a renovation versus a rebuild with a few possible partners, the university entered into an agreement with national student housing developer EdR Trust to submit a redevelopment proposal. The partnership was announced in February 2016, along with the first site plan. The core components of the project were actually fairly consistent throughout the review process. The project would have 850-975 beds, and it would be a mix of townhouse strings and 3-4 apartment buildings, with a 5,000 SF community center to serve it all. The project adheres to New Urbanist neighborhood planning, which emphasizes walk-ability and bike-ability, with interconnected and narrow streets, and parking behind buildings rather than in front of them. Energy-efficient LEED Certification was in the plans from the start. However, the overall site plan did evolve a fair amount, mostly in response to neighbor concerns raised through the review process. Many residents on or near Mitchell Road were uncomfortable with multi-story buildings near them, so these were pulled further back into the complex, and late in the process the remaining Mitchell Street multi-story buildings were replaced with very-traditional looking townhomes with a smaller scale and footprint. More traditional designs were also rolled out for the pair of townhouse strings closest to Worth Street, since neighbors noted they would be highly visible and wanted them to fit in. The building planned in the city’s side was also pulled inward into the parcel early on due to neighbor concerns – it became an open plaza and bus stop. The university was fairly responsive to most concerns, although the most adamant opposition didn’t want any multi-story units at all, and really preferred as few students and as few families as possible. For the record, that is every site plan I have on file. Go clockwise from top left for the chronology. So from beginning to end, there were at least five versions made public. The final product settled on 442 units with 872 bedrooms, with units ranging from studios to 4-bedrooms. It’s also worth pointing out that the town of Ithaca, in which the majority of the property lies (the city deferred the major decision-making to the town), had a lot of leverage in the details. The town’s decades-old zoning code isn’t friendly to New Urbanism, so the property had to be declared a Planned Development Zone, a form of developer DIY zoning that the town would have to review and sign off on. Eventually, the town hopes to catch up and have form-based code that’s more amenable to New Urbanism. The town also asked for an Environmental Impact Statement, a very long but encompassing document that one could describe as a super-SEQR, reviewing all impacts and all mitigation measures in great detail. The several hundred pages of EIS docs are on the town website here, but a more modest summary is here. If you want the hundreds of pages of emailed comments and the responses from the project team, there are links in the article here. Some details were easier to hammer out than others. The trade unions were insistent on union labor, which Cornell is pretty good about, having a select group of contractors it works with to ensure a union-backed construction workforce. Also, at the insistence of environmental groups, and as heat pumps have become more efficient and cost-effective, the project was switched from natural gas heat to electric heat pumps, with 100% of the electricity to come from renewables (mostly off-site solar arrays). Taxes were a bit more delicate, but ended up being a boon when it was decided to pay full value on the $80 million project. It was a borderline case of tax-exemption because Cornell would own the land and EdR would own the structures, and lease the land for 50 years; but Maplewood Park was exempt, so it could have been a real debate. Instead, EdR said okay to 100% taxation, which means $2.4 million generated in property taxes on a parcel that previously paid none. Some folks were also concerned if the schools could handle the young child influx, but since Maplewood Park only sent about 4 kids to the elementary school on average, and the new plan would send 10 students when the school has capacity for another 26, so that was deemed adequate. On the tougher end, traffic is a perennial concern, and Cornell wasn’t about to tell graduate and professional students and their families to go without a car. Streetscape mitigations include raised crosswalks, curbing, and landscaping, EdR is giving the town $30,000 for traffic calming measures (speed humps and signage) to keep the influx of residents orderly and low-speed. A new 600,000 gallon water tank also has to be built (planned for Hungerford Hill Road). One of the thorniest issues were the accusations of segmentation, meaning that Cornell was falsely breaking their development plans up into smaller chunks and hiding their future plans to make the impacts seem smaller. This has come in the context of the Ithaca East Apartments next door, and the East Hill Village Cornell is considering at East Hill Plaza. 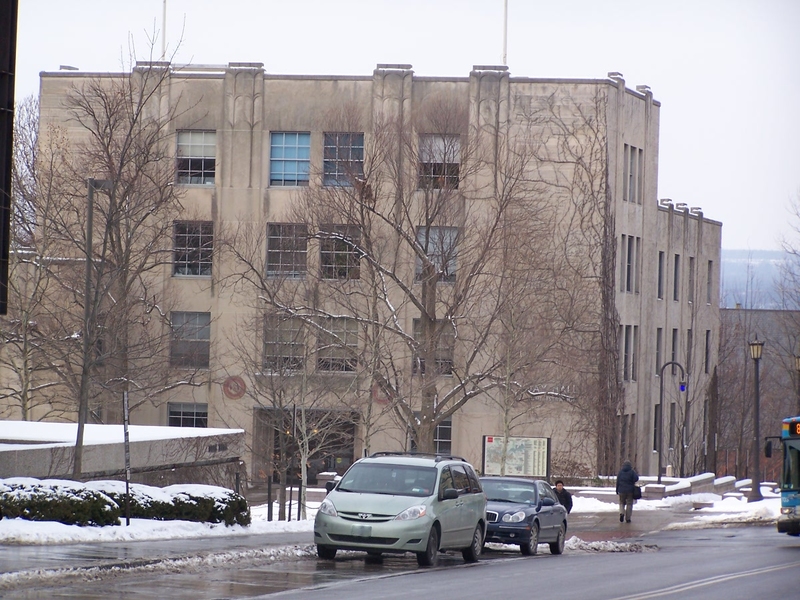 However, neither were concrete plans at the time, and still aren’t – to my understanding, Cornell had some informal discussions about Ithaca East but decided against it early on in the process. And they only just selected a development team for EHV. In the end, many of the concerned neighbors and interest groups were satisfied with the changes, and actually lauded Cornell and EdR for being responsive. The EIS was formally requested in May 2016. The Draft EIS was accepted in August 2016, public meetings on it were held in October, and the Final EIS was submitted at the end of October. After some more back-and-forth on the details (stormwater management plan, or SWPPP), the Final EIS was approved right before Christmas and the project was approved in February 2017, starting work shortly thereafter for an intended August 2018 completion. 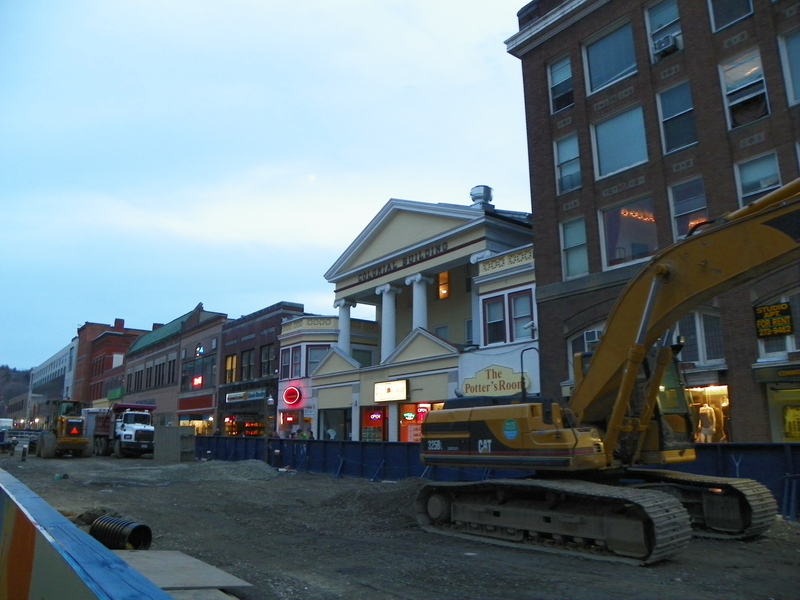 With the wet summer, the project managers asked for a two-hour daily extension on construction (8 am-6 pm became 7 am -7 pm) to meet the hard deadline, which the town okayed with a noise stipulation of less than 85 decibels. Rents for the project, which include utilities, wireless and pre-furnished units, are looking to range from $790-$1147 per bed per month, depending on the specific unit. Back of the envelope calculations suggest affordability at 30% rent and 10% utilities, for 40% of income. Cornell stipends currently range from $25,152-$28,998, which translates to $838-$967/month. On the project team apart from Cornell and Memphis-based EdR are Torti Gallas and Partners of Maryland, New Urbanist specialists who did the overall site plan and architecture. Local firms T.G. Miller P.C. is contributing to the project as structural engineer, and Whitham Planning and Design is the site plan designer, landscape planner and boots-on-the-ground project coordinator for municipal review. Brous Consulting did the public relations work, and SRF & Associates did the traffic study. Although not mentioned as often, STREAM Collaborative did the landscape architecture for the project. The general contractor is LeChase Construction of Rochester. So that’s part one. Part two will look at the structures and site plan itself. And then with part three, we’ll have the site photos. 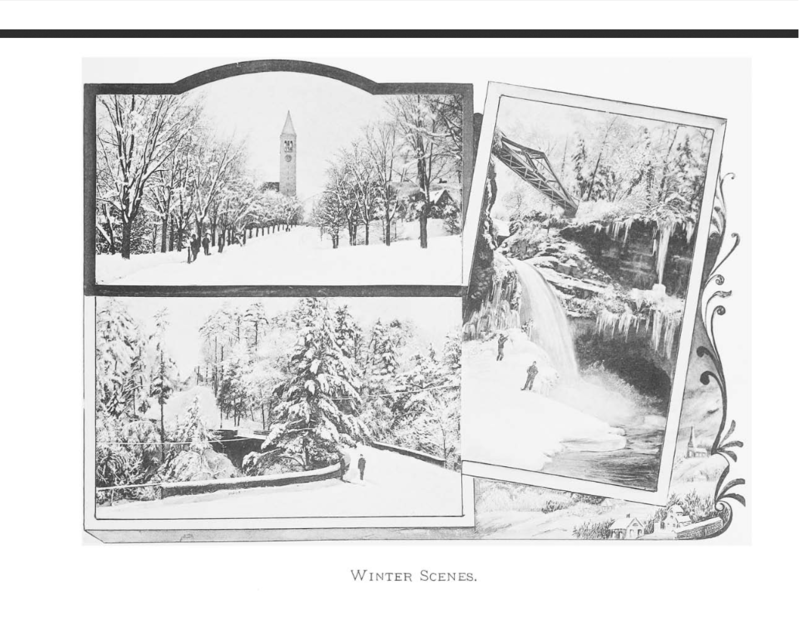 Images from “Picturesque Ithaca”, an 1896 photobook of the city of gorges. Photocopy courtesy of the Tompkins County Public Library. 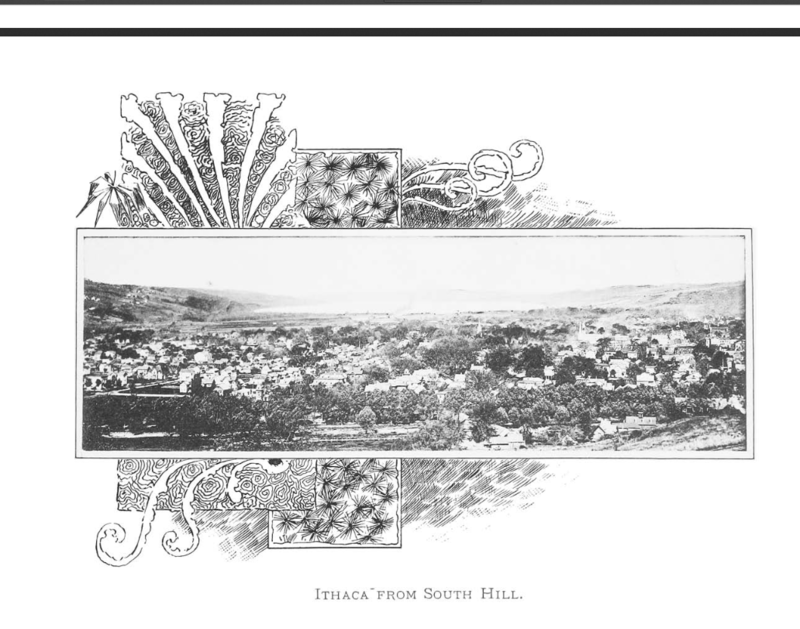 The recently-incorporated city of Ithaca, 1896. At this time, the city was home to about 12,000 people, and Tompkins County had only 33,000 people, less than a third of what it is today. Ithaca College was just starting as a small conservatory downtown, while Cornell had a little over 2,000 students. I never knew the Colonial Building used to be home to the city post office (but now that I check, it served that role from 1882-1910). That, the Sage Block (orange brick) and the Miller Building (red brick) seems to be the only ones standing and still recognizable 119 years later. The lower photo is easier to recognize – the “American Crafts by Robbie Dein” store now sits in the foreground building, and most of the other buildings are still present. One could call that block of the Commons one of the most historic in all of Ithaca. It wouldn’t be a good picture book if it didn’t have at least a couple Cornell photos, and its students and alumni were likely the target audience for this publication. In the top photo, once can make out McGraw Tower, The pyramidal steeple of McGraw Hall, and the windows of the now-demolished Boardman Hall in the distance. The lower photo shows the Ithaca trolley (defunct 1935) that once ran past the college library (renamed in 1962 to Uris Library, for donor/trustee Harold Uris ’25). Both photos also show a relatively lush quad and library entrance, likely lost to the Dutch Elm epidemic that ravaged the campus in the mid-20th century. 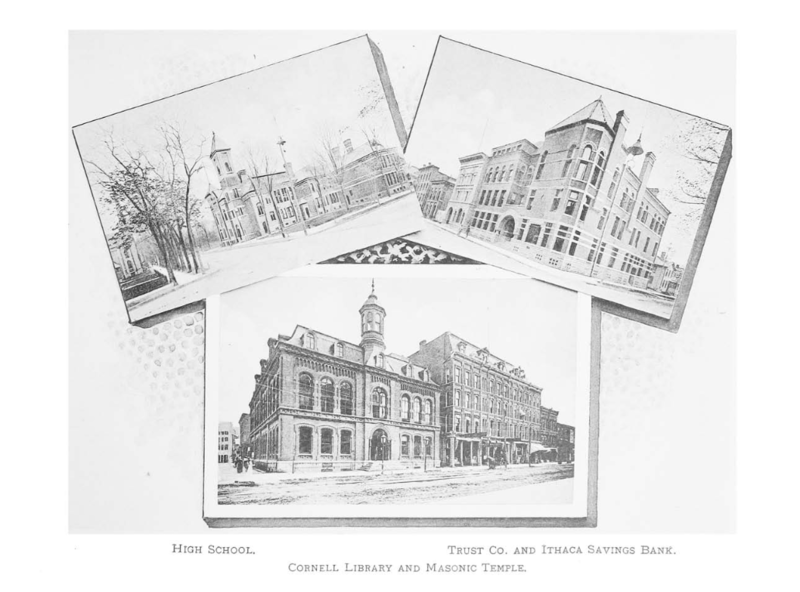 The old old Ithaca High School, the Ezra Cornell Library, the old Masonic Block, and the Trust Company and Ithaca savings Bank Building. All ornate, all lost to history. The old high school burned down in February 1912 and was replaced with the old high school (now DeWitt Mall). The Cornell Library fell victim to urban renewal; it was demolished in 1960 for a drive-thru bank extension and is now a parking lot. The Masonic Block (old old Masonic Temple) dated from the 1870s and seems to have been demolished along with the library (they both were still standing in 1959). 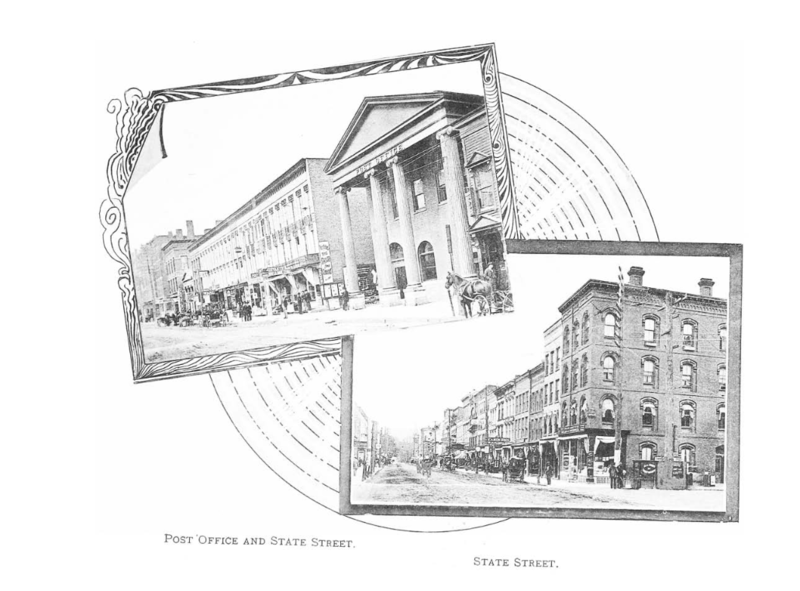 The Ithaca Savings Bank building was designed by William Henry Miller and built in 1887, but the building was destroyed in a fire in the early 1920s, and replaced by Tioga Place (M&T Bank) in 1924. Upper right, the old Triphammer foot bridge. Not heated, wooden, and probably as safe as standing under a flagpole during a thunderstorm. The bridge at lower left looks to be the College Avenue Stone Arch bridge looking northward to Cornell campus. Of the four mansions above, three still stand. Ezra Cornell’s is now the Llenroc (Delta Phi) Fraternity House, A.D. White’s House still sits on Cornell’s campus, and the Henry Sage residence was donated to Cornell, used as an the school infirmary for several decades and is now Sage House, home of the Cornell University Press. 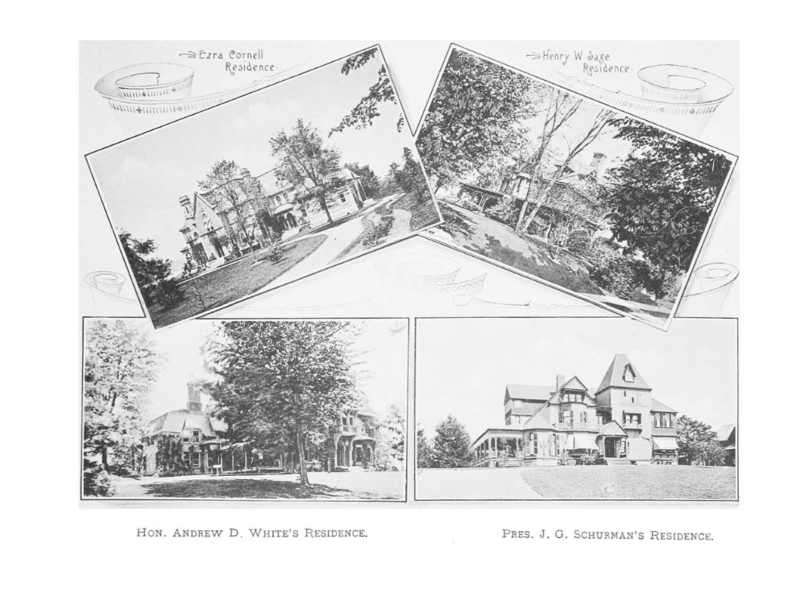 Schurman’s residence at lower right was torn down in the early 1920s to make way for Baker Lab. 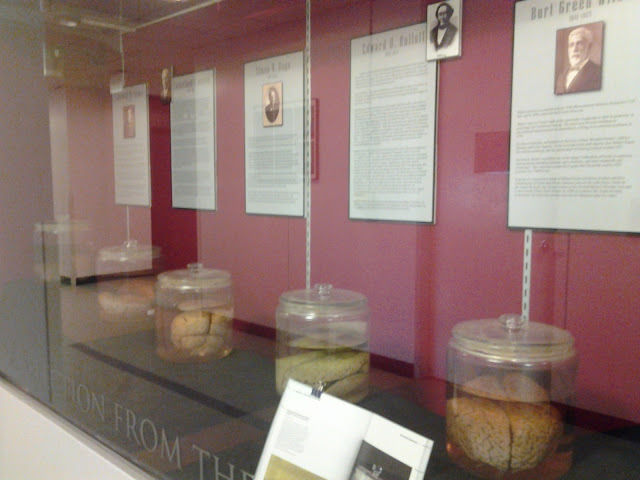 I feel that for all the attention the Wilder Brain Collection gets in Cornell promotional material, the display itself is relatively tucked away in the bowels of Cornell’s Central Campus. 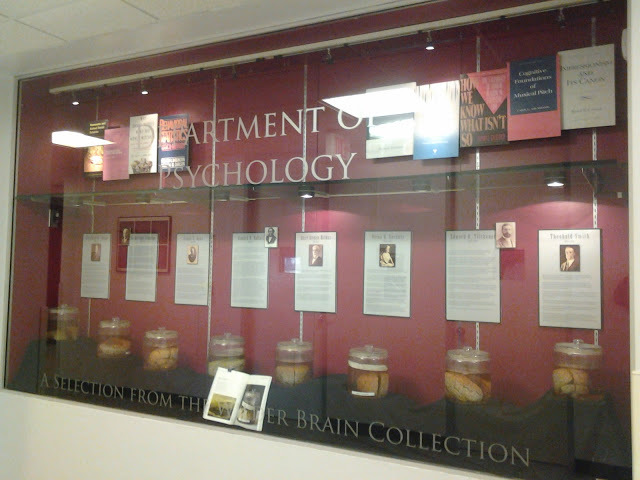 The brains are featured in the “welcome” display of the Department of Psychology, on the second floor of Uris Hall (third if entering from the auditorium side). 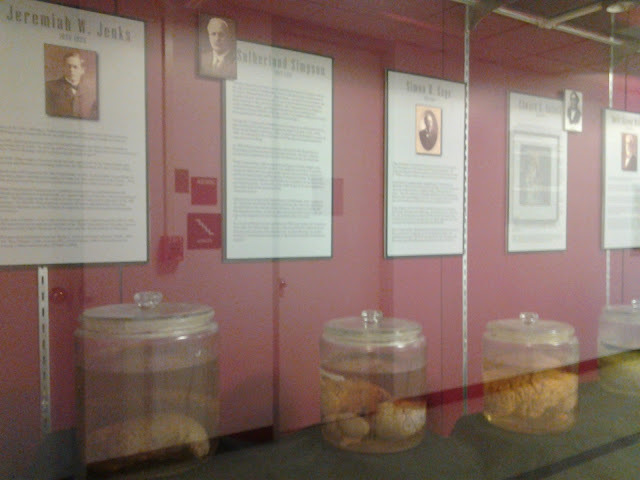 The display itself is pretty modest – eight brains, with page-long biographies of each of the individuals featured, seven male and one female. Perhaps thankfully, none of the brains featured belong to children or young adults, sparing anyone from a fun, happenstance conversation about youth mortality. The collection actually numbers about 70 specimens currently, most of which are stored in a basement closet in Uris Hall (unfortunately, Cornell is not accepting donations from the newly departed). 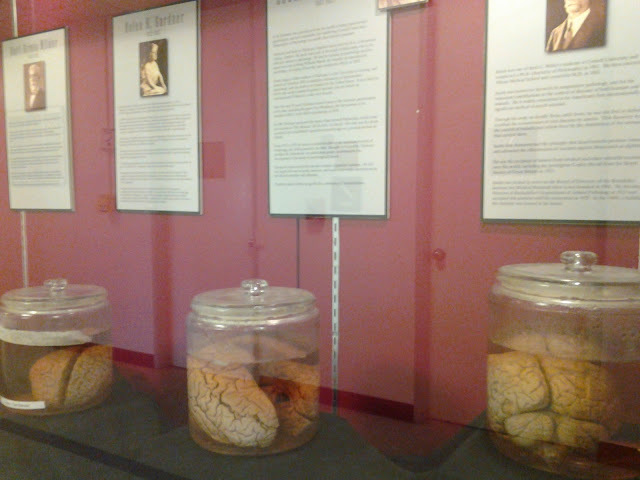 The brain collection used to be much larger, however. It was started by Cornell professor Burt Green Wilder in 1889. Prof. Wilder established the “Cornell Brain Society” with the goal of determining if differences in the size, shape, weight and appearance of the brains could be established between the grey matter obtained from “educated and orderly persons” versus women, murderers, the mentally ill and racial minorities. I’ll give female readers a moment to roll their eyes. The eventual conclusion was that there were no detectable differences, at least none apparent to 19th century methods or the naked eye. This might seem obvious now, but in the 19th century, this was still a largely unexplored realm. For instance, phrenology, a psuedoscience where skull measurements were used to determine ones traits and behaviors, was still accepted in some quarters in the late 1800s. Over time, the number of full and partial specimens collected by Wilder and his successors numbered over 600. Unfortunately, as the years wore on, the brains fell into obscurity, and were not well maintained. By the time Prof. Barbara Finlay assumed the curator role in 1978, many of the brains had “dried up” or were “carried out of the basement via buckets“. This led to the purging of most of the specimens, and the eight selected for display were chosen if only because the psychology department was able to find enough information to write brief biographies on each of the donors. Burt Green Wilder (1841-1925) – The founder of the collection, Wilder was a surgeon for the Union Army during the Civil War, and a professor of neurology and vertebrate zoology at Cornell from 1867-1910. Helen Hamilton Gardener (1853-1925) – An author and prominent suffragette, Gardener donated her brain to the collection to prove that a woman’s brain was in no way inferior to a man’s. Edward Titchener (1867-1927) – A prominent psychologist and Cornell professor, Titchener coined the word “empathy” in a 1909 publication. Henry A. Ward (1834-1906) – A naturalist who pioneered the business of collecting specimens (specifically rocks and minerals) and selling them to colleges and museums. He was also Buffalo’s first automobile fatality. Jeremiah Jenks (1856-1929) – An economist and Cornell professor from 1891-1912. Sutherland Simpson (1863-1926) – A Cornell physiology professor (1908-1926). Simpson had intended in his younger years to become a ship captain, but depending on the source, either a hand injury or a letter from his mother caused him to rethink his plans, and instead he applied for the position of laboratory boy in the physiology department of the Univ. of Edinburgh, which started a long and fulfilling academic career. Simon Henry Gage (1851-1944) – the most recent of the displayed brains, Gage was associated with Cornell from his 1873 enrollment to his death 71 years later. He was an anatomy and physiology professor and co-designed Stimson Hall on Cornell’s campus. Edward Rulloff (1819/1820-1871) – The famous murderer, previously written about here and here. 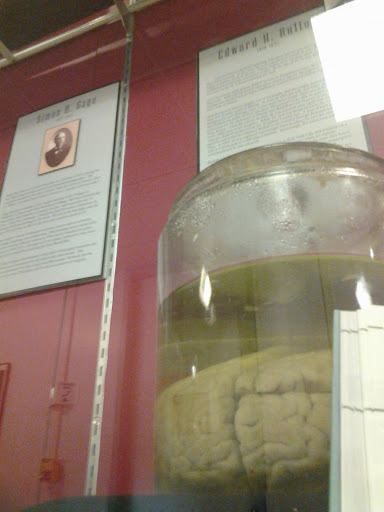 Wilder collected his brain after he was hanged, and declared it to be the largest on record. There are a lot of brains on Cornell’s campuses, though perhaps they’re a little busier than these. During my four years at Cornell, dogs were something of a rarity. I knew a couple of grad students who had dogs, and a couple of fraternities with house dogs, and that was about it. A member of my chapter tried to push a proposal through our alumni Corporation Board to permit the adoption of a house dog, but the board declined, citing concerns about liability (and given the possibility of someone being bitten at a party or something, I didn’t disagree with their decision). Before the 1950s, dogs were far more ubiquitous. For one, the Vet School was located where ILR is today, and then-president Mallott cited the incessant animal noises, including barking dogs, as one reason to move out of the A.D. White House at the start of the 1950s (Altschuler and Kramnick 36; I wager that the student riot in front of his house in 1958 reaffirmed his off-campus preferences). But even outside of the kennels and vet offices (dogs weren’t allowed in lecture halls in the vet school), dogs were accepted and even welcome on the quads, in academic buildings, libraries and even cafeterias. Some thought it was the result of an alumni donation with a stipulation to allow roaming digs free rein of the quads. 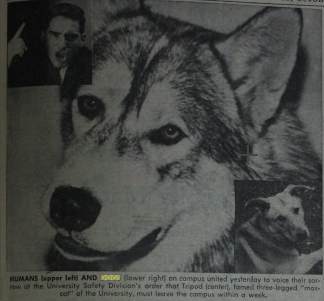 A special focus of the anti-dog sentiment was on a 5-year old, three-legged husky named “Tripod”, who became a sort of quad-wandering unofficial campus mascot in the mid and late 1950s. “Tripod” had three legs as the result of a car accident in November 1953, from which “he hovered for many weeks between life and death“, and his back left leg was paralyzed and later had to be amputated. Officially, he was the house dog of Kappa Delta Rho (KDR) and named Chinook, but like many dogs, wandered campus at his whim. However, Tripod chased a cat to death and was reported to have snapped at students. Eyewitness reports to the Sun claim he was chasing the cat when it ran into the path of a patrolling campus police car, but the police report suggests he mangled the cat, which then crawled under the car. The Sun was not inclined to believe them. 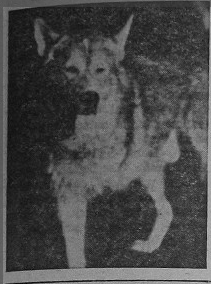 His former owner (Roger Burggraf ’56) claimed him, and once his army tour was completed in Spring 1959, said he would return the husky to Alaska. Tripod had a fraternity-hosted feast in his honor on October 17, 1958, and while it’s not stated whatever happened after he was picked up by his owner the next day, I hope that he lived out some happy days in the last frontier. His now 82-year old owner did return to Alaska, worked as a dog trainer, and was awarded Alaskan of the Year a few days ago, so I have every reason to be optimistic. The removal of dogs took a pause during the 1960s, when civil unrest was the forefront of concerns and soft-hearted professors didn’t care to raise a complaint to the occasional four-legged attendee. Dogs could still walk untethered on campus outside of buildings. But after a large ill-tempered dog bit four students during a chemistry exam in 1973, (AK 233), the university started enforcing a 1971 rule requiring all dogs on campus be leashed (although I don’t think a 1972 recommendation for mandatory dog registration was approved). Tompkins County followed suit in 1980. Gone are the days of dogs frolicking free on Cornell’s campus. Legally, anyway. Altschuler, Glenn C. and Issac Kramnick. Cornell: A History, 1940-2015. Ithaca: Cornell University Press, 2014. Print. It’s pretty clear the the president of Cornell is first in command of the university. However, being that Cornell is a university with tends of thousands of students, thousands of employees, and multiple campuses, it stands to good reason to have a chief academic officer of sorts, a general supervisor of college affairs while the president represents the university’s “public image” and acts as chief fund-raiser. In comes the provost, a position created in 1931 by the Board of Trustees to manage the university’s myriad affairs. The provost is a sort of COO while the president is CEO. Many of Cornell’s provosts haven’t been content with being second in command, the latest example being Provost Kent Fuchs leaving to become president of the University of Florida. Fuchs (pronounced “fox”) has been in the provost position since 2009. His predecessor, Carolyn “Biddy” Martin, who left to take over as president of the University of Wisconsin at Madison. Arthur S. Adams (1946-1948): Bid adieu to Cornell when he was appointed president of the University of New Hampshire. He may not have liked UNH much, because he left in 1950 to head the American Council on Education, and from there on a number of other academic leading roles. He passed away in 1980. Before someone calls me out for not including the provost in 1945, there was no serving provost from 1944-1946. Former Ag school dean Albert Mann (1931-1936) and former Packard Motors executive H. Wallace Peters (1936-1943) both retired after serving as provost. Cornelis de Kiewiet (1948-1951): Departed when he was selected as president of the University of Rochester, a position that he served in from 1951-1961, from which he retired and spent the rest of his years working as a proponent of investing in higher education programs in Africa. A rather unattractive brutalist dorm at the UofR is named after him. Forrest Hill (1952-1955): I should note that provosts under President Mallott seemed to have less power than more recent ones; Mallott enjoyed his authority, something that also led to the student riots of 1958. Hill left to head the Overseas Development for the Ford Foundation, and established rice-breeding institutes that increased yields substantially, and helped propel the “green revolution” of the mid-20th century. Forrest Hill retired to Ithaca in 1976 and passed away 12 years later. Sanford Atwood (1955-1963): Left in 1963 to serve as president of the prestigious southern college Emory University, where he was president from 1963-1977 (and where has a building named in his honor). While at Emory, Atwood became best-known for standing behind a professor who declared a belief that “God is dead”, which didn’t go over very well at the traditionally Methodist institution. He retired from Emory and passed away in 2002. Dale Corson (1963-1969): The only recent case of a provost becoming president, as a result of James Perkins’s resignation following the Willard Straight takeover. Corson, for whom Corson Hall is dedicated, served as Cornell’s leader from 1969-1977, and lived in Ithaca up to his passing in 2012 at the age of 97. Robert A. Plane (1969-1973): Left Cornell to serve as president and CEO of Clarkson University, where he served from 1974-1985. After he retired from that position, he became a winemaker, and eventually came back to work for Cornell as head of the university’s Ag Experiment Station in Geneva from 1986-1990. After he retired again, he served as president of Wells College from 1991-1995, though the college was still all-female at the time. He’s totally, completely retired now, and still kicking at the age of 87. David Knapp (1974-1978): Left to become the president of the University of Massachusetts, where he served as president from 1978-1990, and retired from his professorial duties in 1993. It was Knapp who suggested changing the name of the College of Home Economics to the College of Human Ecology, while he was dean of the college. W. Keith Kennedy (1978-1984): For whom Kennedy hall on the Ag Quad is named. He retired at the end of his term, but served on a number of Cornell committees and Ithaca-based foundations and boards for the rest of his life. Kennedy passed away in Ithaca in 2011 at the age of 92. Robert Barker (1984-1991): Retired from Cornell in 1995, according to the Office of the Provost website, and moved to Washington State. Malden “Mal” Nesheim (1989-1995): Note the overlap with Robert Barker; Barker served as “senior provost and COO”, the only time that position has ever existed, from 1989-1991. Nesheim became provost emeritus in 1995, and is a professor emeritus of the Nutritional Science department, taking part in various committees well into the 2000s. Don Randel (1995-2000): Left in 2000 to become the president of the University of Chicago. Left U. Chicago in 2005 to take over as president of the Mellon Foundation. It appears he’s since retired. Carolyn “Biddy” Martin (2000-2008): Left to take over of the University of wisconsin at Madison. Left that position in 2011 to become president of Amherst College, a small but prestigious liberal arts school in Massachusetts. W. Kent Fuchs (2009-2014): Leaving to take over as president of the University of Florida. So, since WWII and excluding Corson, 8 of the 12 provosts have gone on to serve other schools, and only 3 of 12 stayed with Cornell through retirement. The position is often a high-level stepping stone for administrators with grand aspirations. Not to say they don’t care about Cornell, not true at all; but there’s a good chance that Cornell won’t be throwing a retirement party for the next provost. Entry number five in the Collegetown history series. There’s a lot to dislike about Collegetown. The litter, the students, the traffic, the students, the noise, the students. For as much value as it is to the city’s coffers, I’m willing to wager that a survey of 20 random Ithaca residents on the worst neighborhood in the city would turn up a near tie between Collegetown and specific sections of crime-plagued West Hill. To some, Collegetown could hardly be a worse place. But it can; take for instance, student rioting. Rioting could fall into two fairly broad categories – violent social commentary, or drunken idiocy. Syracuse can provide an example of the latter. Collegetown’s riot may be a little alcohol-infused (particularly the second one discussed here), but mostly they were the result of social unrest. Today’s clock is rolling back to May 1972. That spring had been a long semester at Cornell. Carpenter Hall had been taken over a few weeks earlier, with students demanding that Cornell Aeronautical Lab stop government research (much of their research focused on defense and military concerns), that trustees with a hand in Gulf Oil force the company out of Portugal’s African colonies, and that the ROTC be permanently disbanded. The administration, then under President Dale Corson, said it was “prepared to talk and listen but not negotiate“. The protestors refused to budge, but stormed out to Day Hall when an injunction was about to be served. May 11 started just like any other anti-war rally, with 200-300 students protesting in front of Day Hall at around 10 PM. But when they decided to march to Collegetown, things spiraled out of control. Several students went to the First National Bank on the corner of College and Dryden (the corner where the failed Green Cafe is now), smashed the windows, and tried to set the bank on fire with homemade torches. IPD responded to the rioters with tear gas. Eight protesters were arrested and two policemen sustained injuries, one of which was a broken leg. The rioters, dressed in Halloween masks and being in a destructive sort of mood, retreated to campus, where they smashed the windows of the Campus Store and Day Hall, to the tune of “Day Hall must fall” chants. They marched on to Barton because of its ROTC affiliation, smashing several more windows while Cornell police watched in their riot gear, but did not intervene. By 1:15 AM, the rioters called it a night and dispersed. The damage to Collegetown was estimated to be thousands of dollars, which would be in the tens of thousands when adjusted to 2014 values. 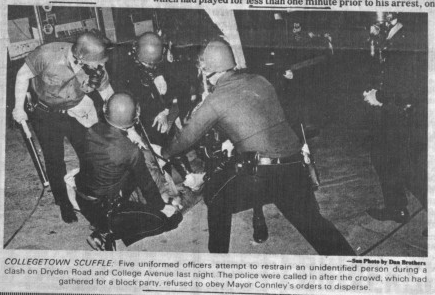 Corson and his administration were none too amused, and vowed to prevent any recurrence with the help of the IPD. That vow would be tested two days later, at a student block party on College Avenue near its intersection with Catherine Street. The party had hundreds of attendees and had been well-publicized, but it lacked the necessary permits from the city (yes, even in the idyllic days of yore, there was red tape). Mayor Ed Conley, remembering the riots two days earlier, was not going to let it slide. The police were out by 6 PM and started to arrest students for minor infractions such as noise violations. The proverbial stick was poking the hornet’s nest, and Cornell’s provost tried to step in on the university’s behalf and offer up party space on campus. But students declined, and unrest began to boil over by 9:30 PM. The officers turned to tear gas to keep the street clear, which fomented the students and encouraged them to act out. Bottles, rocks and obscenities began to fly. 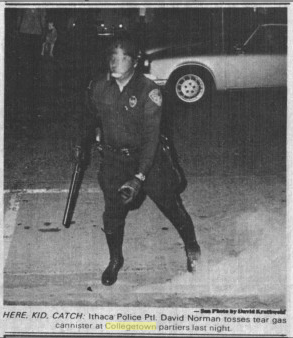 Soon the battlefield had migrated up College Avenue, where IPD threw tear gas into buildings in an effort to gas out what they thought were unruly students taking refuge, but ending up gassing innocent bystanders as well. One store-owner accused the police of starting a fire with a canister thrown into his deli. The rioting continued to 2 AM, and resulted in 29 arrests, including 13 Cornell students. Accusations were thrown around about who started it and who did what damage, and a report some time afterward laid blame on the students, the IPD, the mayor and Cornell (so essentially, everyone was at fault). In retrospect, the May 13th episode was regarded as a giant mistake. The May 11th incident was still a flash point months afterward, a drug-infused example of organized crime per the district attorney and a witchhunt per the students. Not to condone the drunken throngs losing their dinner on the sidewalk, but I suppose I’d rather put up with that than burning buildings and riot gear.